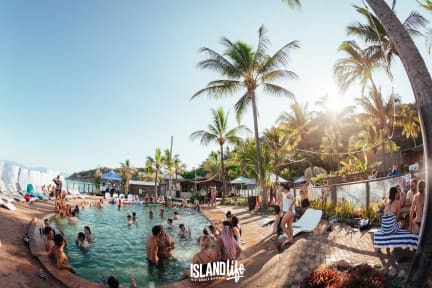 Base Magnetic Island i Magnetic Island, Australien : Boka nu! Most base hostels are good and so is this one! Actually pretty great with nice dorms, good facilities (including kitchen area) and fun bar and pool area. A lot of sunchairs, tables and just places to hang out and meet people. Sunday = pool party day which was definitely a highlight. Highly recommended! Positive: Good atmosphere. The location is awesome, good snorkelling in the sea and a nice pool. Negative: Absolutely nothing to work with in the kitchen. And the kitchen is a mess, few people do their dishes and not nearly enough of the basic stuff like knives, saucepan or mugs. And the toilet paper kept running out. The nastiest kitchen we’ve ever been to.